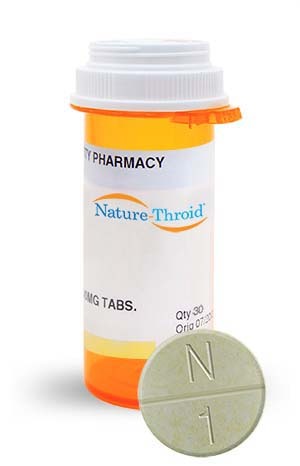 Nature-Throid was first released in the 1930s, making it one of the first available medications for hypothyroidism. Trusted for more than 80 years, Nature-Throid has never been voluntarily or FDA-recalled for inconsistent T4 or T3 hormones. Our affordable and hypoallergenic medication remains in high demand by doctors and patients alike. Take Nature-Throid in the morning on an empty stomach 30-60 minutes prior to food or caffeine with an 8 oz glass of water unless otherwise instructed by your physician. If you’ve already eaten, this medication can be taken two hours after consumption with an 8 oz glass of water, after which you must wait 30-60 minutes before consuming food or caffeine. Some medications and supplements may lower the effectiveness of Nature-Throid when taken together, so it is important to take Nature-Throid at least one hour before any other medication. Calcium supplements, iron products, or antacids must be taken four hours apart. Some foods may cause your body to absorb less Nature-Throid, including walnuts, infant soy formula, cottonseed meal, and high-fiber foods. Talk to your doctor about adjusting your dose if you consume these foods. Always follow these guidelines unless otherwise instructed by your physician. Keep out of reach of pets and children. Nature-Throid is available in 13 strengths. These vary from ¼ grain (16.25 mg) to 5 grains (325 mg). WP Thyroid® and Nature-Throid® TabletsARE PRESCRIPTION MEDICATIONS You are encouraged to report negative side effects of prescription drugs to the FDA. Visit www.fda.gov/medwatch or call 1-800-FDA-1088.